Can you help identify this old band saw? 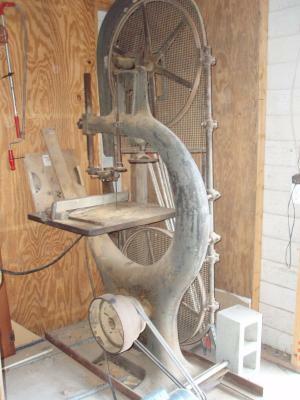 Can you identify this old bandsaw in my storage shed? Comments for Can you help identify this old band saw? Crescent Band Saw made by Silver Mfg. Co. Your saw appears to be an old Cresent made by SILVER MFG.CO.from Salem, Ohio in the early 1900's. I have a 26" one that I use all the time. I don't know what it is, but it's definately cool looking!